It is no revelation that the healthcare payment system in America is broken. That includes dental plans, where an estimated 50 percent of the $110 billion Americans spend each year on dental bills is paid out of pocket. Jake Winebaum thinks there is a better way to reduce those out-of-pocket expenses, and he’s quietly launched Brighter to offer online marketplace for dental care with negotiated discounts. Brighter is part of a new class DIY healthcare startups just now beginning to emerge. These work outside the traditional health insurance industry. “Our mission is to provide affordable dental care to people without dental insurance,” says Winebaum, who is best known for starting Business.com in 1999 and eventually selling it for $350 million. He founded Brighter last year, and raised $5 million from Mayfield in January. Brighter is a simple service. You put in your zipcode and the procedure you are looking for, and it returns all of the dentists nearby, along with the prices they charge for each procedure and any negotiated discount. 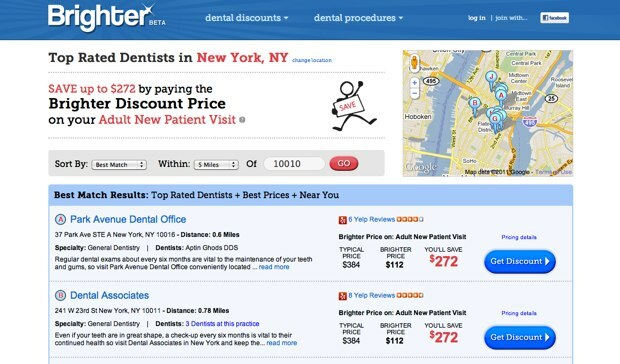 Brighter already has negotiated discounts with 25,000 dentists in North America, about a quarter of the total. Brighter offers 20 to 30 percent discounts off the bat for free off of what you’d pay without insurance, and up to 60 percent off if you buy the $79/year plan. The first 500 TechCrunch readers to book a dental appointment through Brighter and use the code TCBrighterSmile500 will get a free premium plan for a year. Brighter also offers plans for small businesses which cost $49 per employee—this one could become popular at all those startups without dental plans. Unlike insurance, there are no caps and no procedures are off limits. You can see exactly how much the procedure will cost online and even shop around. Compare that to the way it works today. Patients only find out, says Winebaum, “what something will cost them when they are sitting in the dentist chair—not a great place to have negotiating leverage.” Dentists like it because they get paid right away and don’t have to argue with insurance companies for services already rendered. When you do a search on Brighter, dentists come up based on rates, ratings, and proximity. It pulls in Yelp ratings and reviews, or you can add your own ratings on Brighter. You can even give your dentist a Facebook like. There are 40,000 Tweets a day about dentists. “Those are people in need,” notes Winebaum.